It was awesome waking up to this link in my Facebook Messenger. Of course, Mike has kept a low profile for the last year or so, which probably makes him marginally smarter than Ken. $120k+ between them. I should have realized but seeing the number on the screen certainly does bring it into focus. Of course, the money did not "mysteriously disappear." It was invested in Castle Nystul, a company with an office, staff, salary, expenses and no income aside from the KS funds. Oh Mikey! Reach for the stars, shoot self in foot, hit the road and then run into hiding. Hell, THIS should be a documentary! When it comes to the two persons I believe Mike funcked up, and is actually feeling the pain. 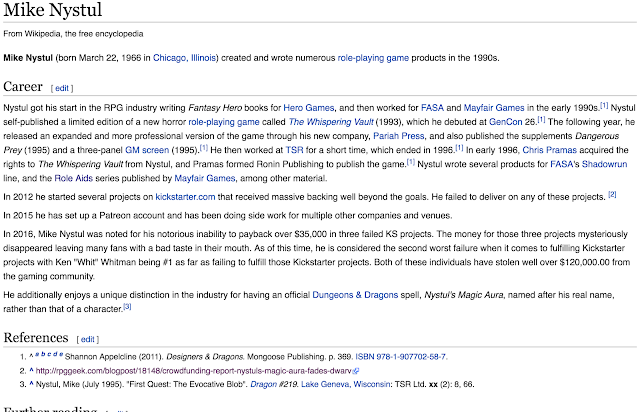 But at least he got a spell named after him... Take that, Ken Whitman! Who wants to stat up "Whitman's Magic Aura"? BTW, wouldn't "Whitman's Magic Aura" be a perfect spell for a mountebank? When this spell is cast, you increase one creature's opinion of you to "friendly". If during conversation you can convince them to give you coins or gems, you immediately become both silent and invisible after the valuables are handed over. The victim must pass a saving throw initially to avoid becoming friendly, and afterward to avoid forgetting that they ever met you or gave you valuables. The grows longer every year. I thought the spell wasn't named after him? Wouldn't he have been like 12 when the PHB was published? I think Nystul's Magic Aura was introduced during the 2e era, when he was an adult, possibly during his brief period of employment at TSR. Aha! I knew it. 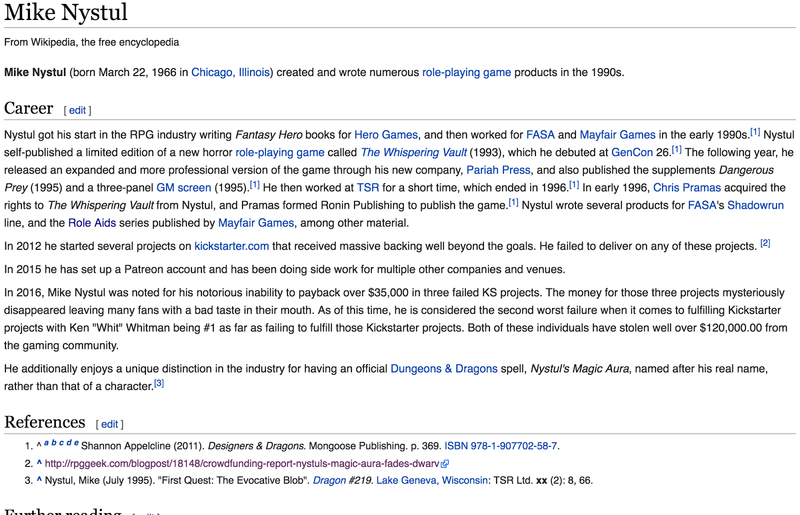 Gygax said over at EnWorld that Nystul, one of his NPCs, was named after a stage magician, Brad Nystul. Nothing to do with this loser at all. Always suspected this, glad to see it confirmed by none other than EGG. Which is fine, but it doesn't mean the spell was named after Mike, as he has claimed repeatedly.